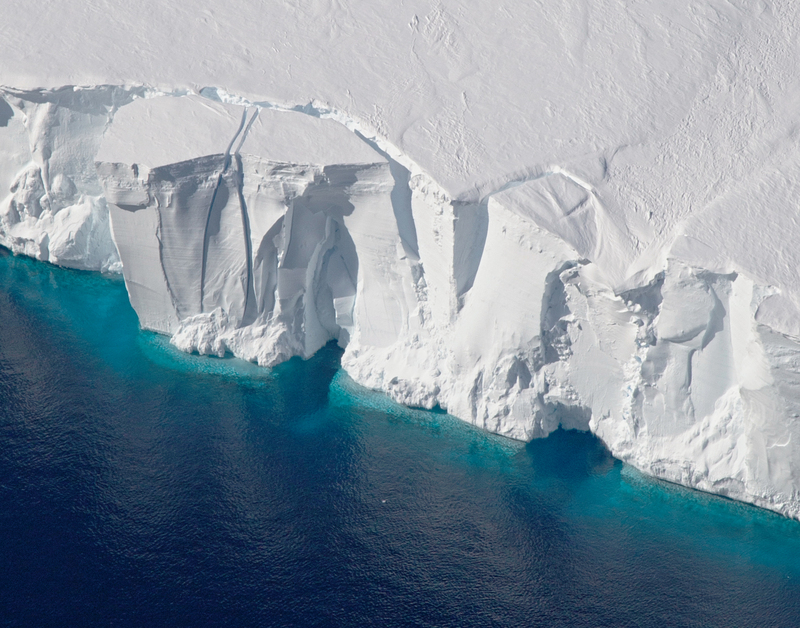 Photos by Jeremy Harbeck, NASA's Goddard Space Flight Center/Operation IceBridge. Caption by Kathryn Hansen. As scientists and crew with NASA’s Operation IceBridge mission prepared for a research flight on November 5, 2016, the weather in Punta Arenas, Chile, was cold, wet, and windy. But when they reached their survey site in West Antarctica, skies were clear and winds were calm—a perfect day for scientists to collect data over the Getz Ice Shelf. IceBridge, now in its eighth year, continues to build a record of how ice is responding to changes in the polar environment. 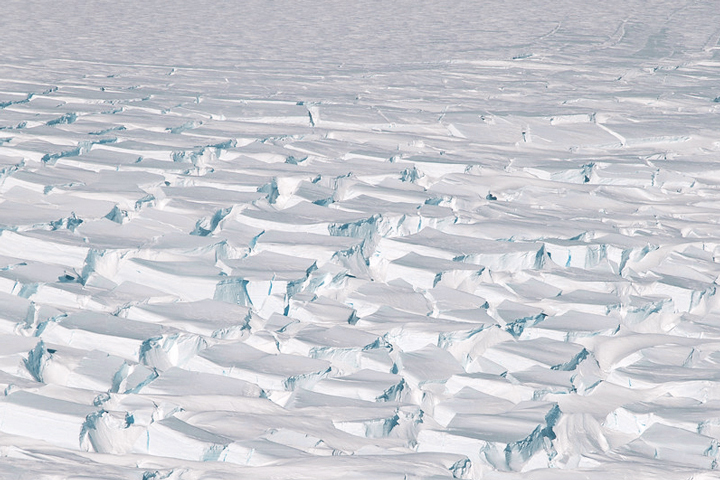 The Getz Ice Shelf in West Antarctica is one area that scientists try to examine each year. 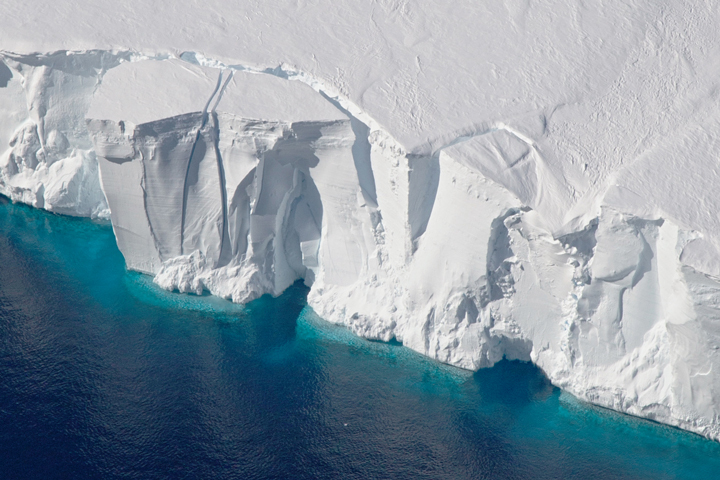 “Getz is an ice shelf that has been experiencing some of the highest basal melt rates of the Antarctic ice shelves,” said Nathan Kurtz, IceBridge project scientist and a sea ice researcher at NASA’s Goddard Space Flight Center. The images above show two views of Getz as photographed on November 5 from a NASA research airplane by Jeremy Harbeck, a sea ice scientist at NASA Goddard. The top image shows ice in the process of calving from the front of the shelf, soon to become an iceberg. The second image shows an area farther upstream, near the grounding line—the boundary where the ice sheet loses contact with bedrock and begins to float on the ocean. 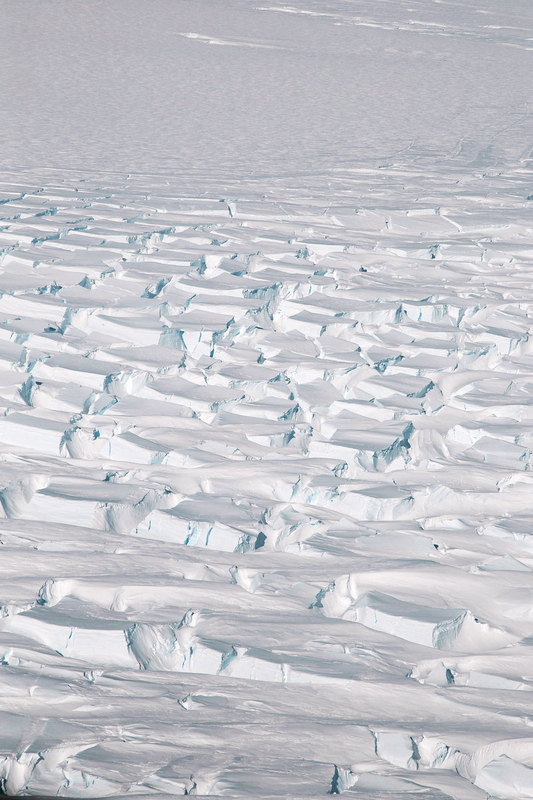 Here, a web of deep cracks, or crevasses, spans the icescape. Kurtz notes that the team has flown over the Getz Ice Shelf many times before. Flight paths are often exact repeats of those flown in previous years, which helps scientists understand how the height of the ice surface changes over time. This year, new flights over Getz were added to the existing observations. Scientists mapped the bathymetry (shape and depth of the seafloor) below the ice shelf, and they mapped the ice surface and bedrock upstream of the grounding line. The flight over Getz is just one of a number of key areas flown during the IceBridge campaign. Each flight plan is prioritized in order of importance: baseline (the highest priority), high, medium, and low. The flight on November 5 over Getz, for example, was categorized as “high” priority. Since the start of 2016 science flights on October 14, the team has flown six out of eight baseline missions, eight out of 15 high priority lines, and one medium and low priority mission each. Research flights for the season continue through November 18. Alley, K. et al. (2016, March 14) Impacts of warm water on Antarctic ice shelf stability through basal channel formation. Nature Geoscience , 9, 290–293. Flickr: NASA ICE (2016) IceBridge Antarctica 2016. NASA’s Goddard Space Flight Center (2016) Cryospheric Sciences Laboratory. NASA’s Goddard Space Flight Center (2016, October 17) NASA Launches Eighth Year of Antarctic Ice Change Airborne Survey.